Many economic indicators, however, ended the year on a slide. December consumer spending contracted 0.5 percent month-over-month (m/m) from November. “Unless there is a big upward revision to the disastrous December retail sales figure [which decreased 1.2 percent m/m], the weak end-of-quarter consumption profile provides for very challenging arithmetic for first-quarter consumption growth,” said Michael Feroli, an economist at JPMorgan. 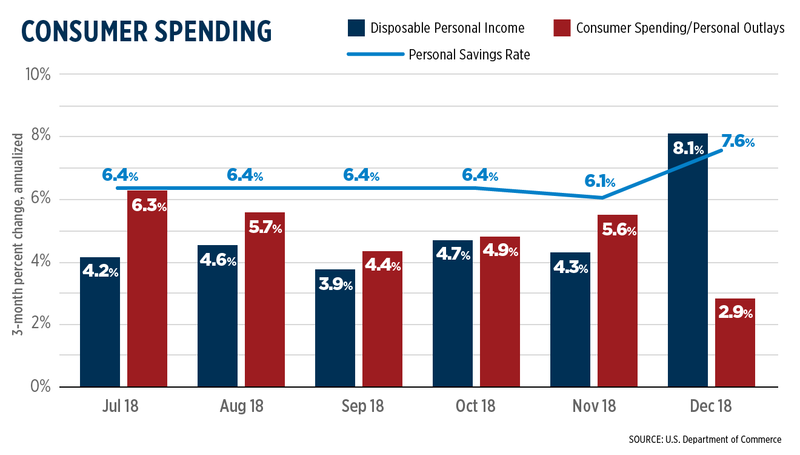 That said, personal income surged by 1 percent m/m in December, meaning that consumers ostensibly saved more for future spending in 2019. “The consumer is trending lower, though consumption is still strong,” said Constance Hunter, chief economist at KPMG. However, she also noted another concern in “housing investment, which fell for the fourth-consecutive quarter. If this continues into 2019, it will be a worrying signal for future growth.” Following the trend of a December disaster, housing starts plummeted by 11 percent in December. Indeed, the current outlook for real GDP growth for the first quarter of 2019 will show a sensitive reaction to current U.S. economic data. After consensus estimates of around 2 to 2.5 percent annualized growth for the first quarter of 2019, the Atlanta Federal Reserve’s GDPNow estimate forecasts 0.4 percent annualized growth for the first quarter. The New York Fed’s Nowcasting report remains more optimistic, plunging from an earlier expectation of 2.5 percent growth in the first quarter to now a more subdued 1.4 percent. Travel jobs reflected the national trend, with the industry adding 400 jobs in February after strong showings in December and January. Employment in airlines and lodging industry edged up in the month, while employment declined slightly in the amusement/gambling/recreation industry. Food services/drinking places employment remained unchanged. 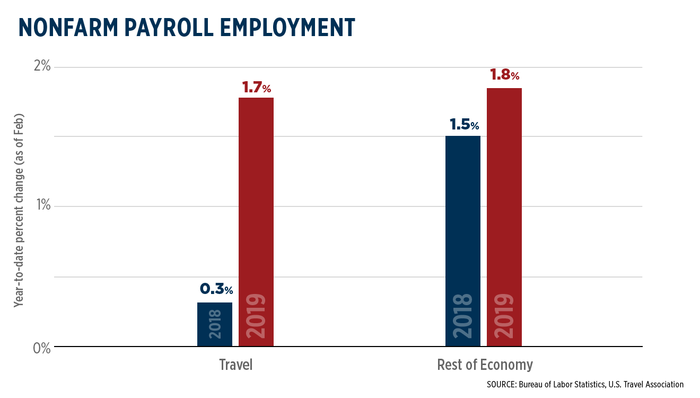 The 34,400 travel jobs added from the beginning of 2019 represent a 1.7 percent year-to-date increase from the first two months of 2018, more-or-less even with the 1.8 percent year-to-date increase in non-travel jobs over the same period. The travel industry has almost twice as many female employers as other sectors around the world, according to World Travel & Tourism Council (WTTC)’s Travel and Tourism: Driving Women’s Success. Additionally, the female share in travel employment is greater than that of the overall economy in 11 of the 19 G20 countries studied. Across the G20, women account on average for 46 percent of travel employment, compared with 43 percent of employment in the economy as a whole. Countries that saw strong growth in their travel and tourism GDP also saw a significant improvement in the share of women’s employment. Increasing female employment aids in poverty reduction, sustaining economic growth and supporting women’s empowerment and independence. However, challenges of gender equality still persist and policies are recommended to aid in increasing women’s employment and ensuring women have access to skills and talent development. 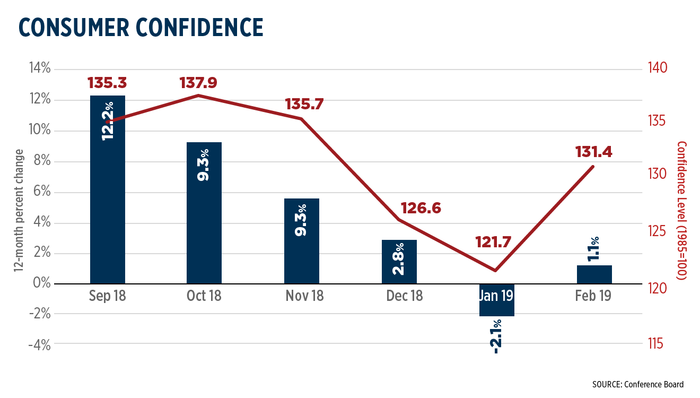 Consumer Confidence rebounded strongly in February, turning in a reading of 131.4 points, according to the Conference Board. The Consumer Confidence Index gained 9.7 points from January, following three consecutive months of decline. 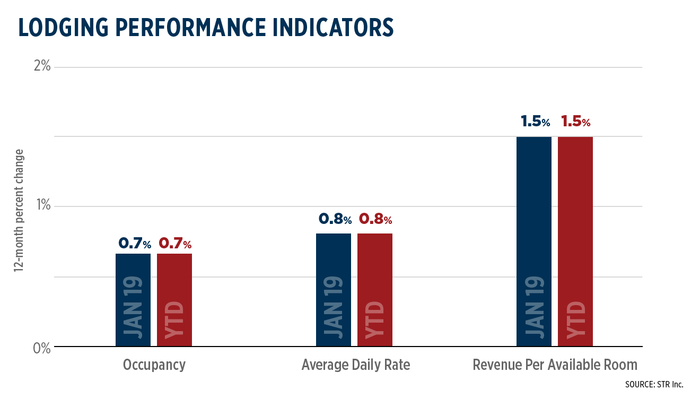 According to Lynn Franco, senior director of economic indicators at the Conference Board: “Expectations, which had been negatively impacted in recent months by financial market volatility and the government shutdown, recovered in February. "Looking ahead, consumers expect the economy to continue expanding. However... the pace of expansion is expected to moderate in 2019.” The recent decline in consumer confidence has generally been seen by economists as a momentary blip due to the partial government shutdown; “It would not be surprising if the consumer pulled back in January [too]…given heightened anxieties at that time, but the underlying fundamentals for the consumer remain extremely positive,” noted Stephen Stanley, chief economist at Amherst Pierpont Securities. 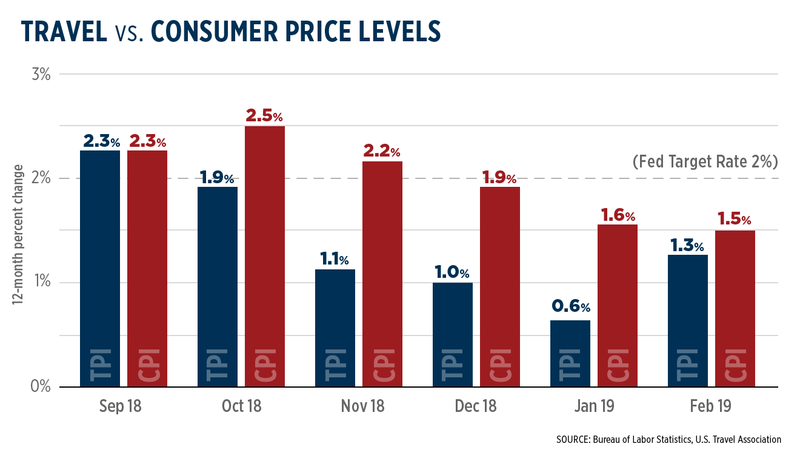 The report also showed future inflation expectations continued to fall, hitting the lowest level in about 15 years, signaling consumers increasingly aren’t willing to accept, or can’t pay for, steep price increases. Consumers ended 2018 with a whimper, with both personal outlays and retail sales numbers down for the month of December 2018. Personal consumption expenditures (PCE) finished the year by contracting 0.5 percent month-over-month (m/m) from November.Likewise, retail sales fell 1.2 percent m/m in December, rebounding only 0.2 percent m/m in January 2019 (January 2019 PCE numbers remain delayed due to residual effects of the partial government shutdown). Economists “were afraid... to have another lousy set of numbers like December… January retail sales [numbers] were a relief,” said Robert Frick, economist at Navy Federal Credit Union. Frick remained pessimistic, noting that the soft retail numbers were a sign that economic momentum “is dropping, [and] it’ll drop throughout the year.” However, economists still “expect consumers... to be a pretty solid performer for the economy this year,” said Michael Feroli, chief U.S. economist at J.P. Morgan. One silver lining: weak spending and a boost in personal income shot the personal savings rate up to 7.6 percent in January from a low 6.1 percent reading in December. Inflation also slowed in December per the PCE Price Index, the Federal Reserve’s preferred measure of inflation. Headline inflation softened to 1.7 percent year-over-year (y/y) in December 2018, 0.2 percentage point (ppt) slower than the 1.9 percent y/y growth in prices seen in November. December’s core PCE inflation (which excludes food and energy items) remained consistent at 1.9 percent y/y growth. Prices may remain flat through January; the Labor Department’s Consumer Price Index noted that February 2019 prices increased 0.2 percent m/m after three consecutive months of remaining unchanged. However, on a yearly basis, CPI consumer prices slowed from 1.6 percent y/y in January to 1.5 percent y/y for February. Once again, this was due mostly to a sharp drop in energy prices: core CPI registered at a healthier 2.2 percent y/y gain in February, though this also slowed down 0.1 ppt from January. Much like consumer prices, travel prices shot up on a monthly basis but slowed down on a yearly basis, according to U.S. Travel’s Travel Price Index (TPI). The TPI increased 0.8 percent m/m following two consecutive months of decline, but, at only 1.3 percent y/y growth for February, TPI remained 0.2 ppt below the CPI in terms of 12-month inflation. 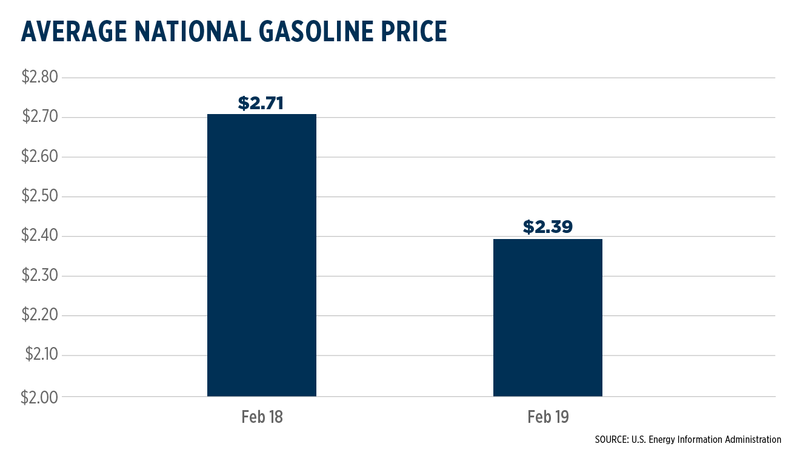 Much of this was driven by fluctuations in energy prices: motor fuel prices increased 1.5 percent m/m in February and decreased 8.9 percent y/y. However, this phenomenon was seen across other transportation price indicators as well. Lodging prices and fares increased remarkably on both a monthly (1.4 percent) and yearly (4.1 percent) basis. The annual U.S. trade deficit in goods reached an all-time high in 2018. According to Commerce Department preliminary estimates, U.S. consumers bought $891 billion more in foreign goods than U.S. businesses sold to foreign consumers last year. Including services, the annual U.S. trade deficit reached a 10-year high of $621 billion in 2018. Despite the presence of trade disputes that could stifle trade, the expansion of the deficit was marked by an overall increase in international trade volume: exports grew by $149 billion (6.3 percent), and imports grew by $218 billion (7.5 percent). In fact, according to Kenneth Rogoff, economics professor at Harvard University, “the fact that the U.S. economy is doing very well is the main reason the trade gap has risen,” noting that restrictive trade “policies that play around... with tariffs are always going to get swamped by macroeconomic factors. That’s what happened, as everyone predicted” despite the Trump administration’s policy goals of reducing trade deficits through tariffs. And, while consumers continue to import goods at a heavy clip, export demands for U.S. goods and services continued their dramatic slide in December. The December trade gap expanded by nearly one-fifth (18.8 percent) to $59.7 billion: exports decreased by $4 billion (-1.9 percent m/m) and imports increased by $5.5 billion (2.1 percent m/m). Travel’s international trade balance was not immune to the annual national trend. Travel exports faltered slightly in December to $21.2 billion reading (-0.2 percent y/y change), but hovered around all-time highs throughout 2018. 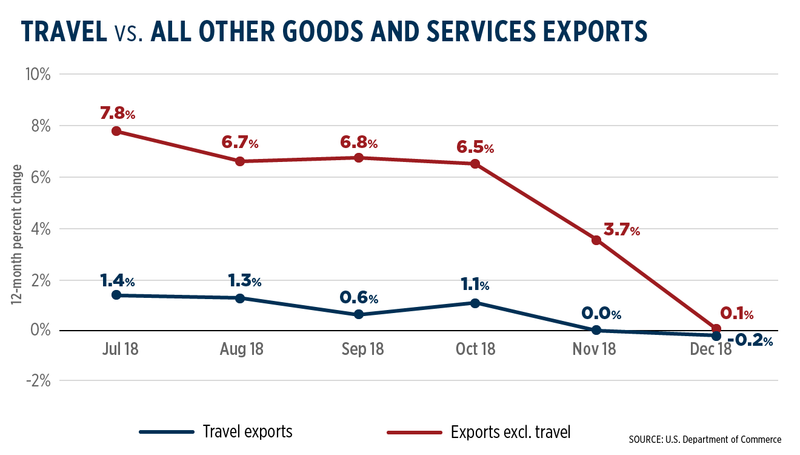 Exports from other industries, which had increased at a faster rate than travel exports throughout the year, flattened in December as well (0.1 percent y/y change). As such, travel exports accumulated an annual total of $256 billion, a 1.8 percent increase from 2017. However, American travelers spent $13 billion more abroad in 2018 than in 2017, posting a new all-time high of $187 billion (a 7.6 percent increase). The resultant trade surplus was 11 percent lower than in it was 2017, but the total U.S. trade deficit in 2018 would be 11 percent larger were it not for the $69 billion trade surplus generated by foreign travelers to the U.S.
Business investment recovered slightly from a disastrous December, according to estimates from the Census Bureau. Core durable goods orders, a proxy for GDP business investment calculations, increased 0.8 percent month-over-month (m/m) in January, after a 0.7 percent m/m contraction in December. Core durable goods orders, which exclude defense and aircraft purchases, were obscured by headline durable goods orders for both months: large civilian aircraft orders drove headline durable goods order increases of 1.2 percent m/m and 0.4 percent m/m for December and January, respectively. Economists were relieved, as the January reading “suggests investment didn’t fall off a cliff around the turn of the year,” said Michael Pearce, senior U.S. economist at Capital Economics. Pearce said that the reading “helps to push back on the notion that the economy caught a cold in December” and is spiraling toward a recession. Travel industry business activity was mixed for the first couple months of 2019, according to the Federal Reserve’s Beige Book. Of the seven districts reporting on business conditions, only three reported modest gains in tourism activity (Kansas City, St. Louis and Atlanta). The Kansas City District in particular, which represents many Great Plains states, noted “steady-to-modestly higher levels of [travel] employment” with travel business activity increasing “modestly compared to the previous survey period.” Mixed reviews came from the districts along the eastern seaboard. New York City, following “a brisk holiday season” for travel, noted that “hotel occupancy rates, though still fairly elevated, slipped below year-ago levels,” but tourism in the rest of the states reported “steady, moderate growth.” The Richmond district, which also represents the Carolinas, reported similar issues, while travel business “picked up moderately,” the government shutdown claimed a “sharp drop in visitors” in Washington D.C. The Philadelphia district, as well, lamented that “the Eagles’ 2019 playoff run included no home games” and that the “government shutdown closed several national park attractions, reducing tourism activity in the city” and lowering hotel occupancy rates. Despite the 35-day partial federal government shutdown’s effect on air travel, the year started off positively for all sectors of travel. International inbound travel grew 3.2 percent in January, bypassing its six-month moving average of 2.8 percent growth. Domestic leisure travel grew 3.4 percent, besting business travel’s 2.8 percent growth rate; the margin between domestic leisure and domestic business travel has narrowed over recent months. 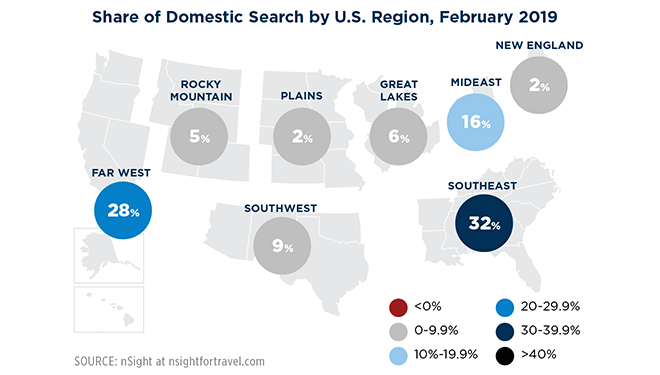 The latest U.S. Travel Barometer reported that 83 percent of U.S. residents searching for lodging in February searched domestically, down from 88 percent the year prior. Mexico captured 3 percent of U.S. resident searches in February—indicating stronger demand for U.S. residents traveling abroad. The Mid East region experienced the largest increase in share of searches year-over-year, up 2 percent. Still, by far, interest to the Southeast was strongest, capturing 32 percent of searches followed by the Far West with 28 percent. A recent survey commissioned by PGAV to understand the outlook on the attractions industry found that 47 percent of Americans expect the U.S. economy to improve in the next six months—slightly lower than 2017—and 22 percent expect the economy to worsen. While interest in visiting attractions is predicted to be flat, first-time visitors to attractions reached their highest level ever at 47 percent. Americans are seeking more time with friends and family when they travel, according to the fourth-annual Voice of the Visitor: Outlook on the Attractions Industry report. Compared to five years ago, Americans noted spending more time “relaxing and chilling out” (+27 percent) and spending time outdoors (+16 percent) while spending less time playing video games (-10 percent) and hanging out with friends online (-5 percent). Following these trends, in 2018 the top visited attraction types included historic landmarks (38 percent), zoos/animal attractions (33 percent), theaters (30 percent), theme parks (30 percent), history museums (28 percent) and national/state parks (27 percent). The top five most important factors for Americans traveling to attractions are: good value (79 percent), cleanliness (78 percent), friendly staff members (71 percent), safety (70 percent) and a diverse experience (69 percent). Travelers have an increased preference for hyper-local, unique, and transformative travel experiences, according to Skift’s U.S. Experiential Traveler Trends 2019 report. Other notable trends show travelers are more motivated to travel by adventure than they were in the past and are more likely than ever to have stayed in an Airbnb. Travelers are also more thoughtful about the environment and their own personal wellbeing. Both of these factors have strong ramifications when it comes to travel preferences and behaviors. North American Millennial travelers are tired of researching for their vacation, with 42 percent of millennial travelers saying this process is one of their biggest stressors, according to a recent study from Hotel.com. The average millennial traveler spends 8 hours of research on their vacation, becoming bored after just 40 minutes of research. One in eight travelers spend over 15 hours researching before booking their vacation, and 22 percent consider at least 11 different vacation options before settling on their destination. Some of these travelers book vacations to a destination they have already traveled to avoid the research (51 percent) and others would consider hiring a travel agent or friend to not have to research their own vacation (38 percent). Solo travel is on the rise as nearly one in four Americans prefer to travel alone. Travelers are much more likely to go out of their comfort zone when solo traveling (57 percent) and explore local markets and shops (58 percent), talk to locals (50 percent) and be spontaneous (45 percent). Nearly half of Americans (45 percent) agree that traveling with somebody holds them back while on a trip. They worry their travel partner may not want to do something they want to do (58 percent), or vice-versa—that they’ll be pressured into doing something they don’t want to do (53 percent) —or they worry they’ll get on each other’s nerves (36 percent). Safety is the top concern for Americans traveling alone with 52 percent believing solo travel is a lot less safe, and 49 percent worry about getting lonely on solo travel. Still, solo travel is expected to continue to rise as nearly half of Americans surveyed (44 percent) said they are likely to do a lot more solo travel in the future. Over 77 percent of Destination Management Organizations (DMOs) have designated marketing operations, a majority of these team-based, according to Skift’s recent report, Marketing Operations in the Travel Industry Benchmarks: Destinations. The top four responsibilities of these teams are budget setting and tracking (85 percent), project management (83 percent), cross-functional communications (83 percent) and tech development (70 percent). It is clear DMOs have continued to invest in tech capabilities. From a budget standpoint, a combined approach is most common, adopted by 36 percent of DMOs, where a budget is set once a year but adjusted as needed; however, the outperforming DMOs were more likely to use an activity-based budget approach. As with any business, DMOs recognized the importance of evaluation with 83 percent measuring the success of their marketing operations. 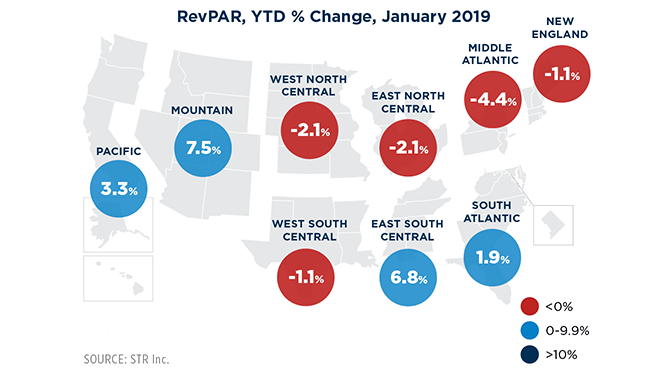 According to STR, RevPAR performance varied across specific regions in January 2019. Despite increasing 1.5 percent year-to-date across the country, only 10 of the Top 25 hotel markets saw growth in RevPAR. Specifically, the Houston area posted one of the largest decreases in RevPAR (-17.2 percent YTD to $56.65). The San Francisco/San Mateo, California city market reported the highest jump in RevPAR, up 12 percent to $220.88. This drove a healthy RevPAR increase for the Pacific region of 3.3 percent YTD. CBRE Hotels Americas Research forecasts steady growth for US hotels through 2020 with revenue per available room (RevPAR) growth of 2.5 percent in 2019 and 2 percent in 2020 at U.S. hotels, but a blip in 2021. This 0.6 percent slight decline in 2021 is projected to be followed by an immediate 1.4 percent increase in RevPAR in 2022. A primary cause of the economic blip in 2021 is a forecast decline in the national levels of employment in both 2021 and 2022. Previous research conducted by CBRE found that the performance of hotels operating in the lower-priced chain-scales is closely correlated to changes in employment. Accordingly, the forecasts for 2021 RevPAR declines average 1.3 percent for the bottom three chain-scales. At the same time, the RevPAR falloff for upper-priced properties is expected to average just 0.8 percent. The economic costs of Airbnb likely outweigh its benefits according to a recent report from the Economic Policy Institute. While Airbnb expands short-term accommodation options, Airbnb does not drive travel (only 2-4 percent of survey respondents indicated they would not take a trip if Airbnb rentals were unavailable), meaning Airbnb is simply a substitution for other accommodations. The report also states that Airbnb can create disruption in the neighborhood from negative externalities including noise and trash, to rising housing costs in areas where Airbnb is prevalent such as in New York City where Airbnb expansion may have increased average annual rent by almost $400 for city residents. In addition, Airbnb’s capacity to lower the transaction cost of operating disproportionately benefits white and high-wealth households. American Hotel & Lodging Association (AHLA) recently released a lodging survey highlighting advancements in amenities, guest services, sustainability and technology, in addition to other industry trends. This recent survey underscores how hotels advance, accommodate and innovate the guest experience. Consumers can expect seamless transitions between their everyday lives and their lives on the road thanks to increased mobile compatibility, flexible dining options and welcoming accommodations. The survey reports hotels are catering to millennial travelers by focusing on “community and convenience”. More hotels are also practicing sustainable initiatives, with Green Certification at hotels at 25 percent in 2018, up from 16 percent in 2016. Nearly 900 million passengers boarded U.S. air carriers in 2018, according to recent Transportation Department data. 2018 was a banner year for air travel, with total systemwide passenger enplanements increasing at 4.8 percent, faster than the annual increases seen in 2017 or 2016. Air travel demand also closed 2018 strong: 82.9 million passengers boarded planes across all U.S. airports in December, a year-over-year (y/y) of 3.8 percent. Domestic flights accounted for over three-fourths (77 percent) of all U.S. passenger enplanements in December with 63.6 million passengers. Over 19.2 million passengers boarded international flights from the U.S. in December, increasing at a faster rate than the total systemwide average (4.2 percent). TSA expects to screen approximately 107 million travelers and airline crew members for the spring season between March 14 and April 28, a 3 percent increase over the same period last year. TSA is ensuring “the highest level of security for the traveling public even as passenger volume continues to increase.” The influx of travelers during the busy travel period could lead to longer wait times in airports. TSA recommends that travelers seeking to avoid long wait times sign up for Precheck. Consumers spent an estimated $871 billion on air travel in 2018, with over 4.3 billion travelers worldwide. With recent mergers, some U.S. airlines have become colossal mega-carriers; Business Insiders analyzed how U.S. airlines stacked up against the largest airlines in the world to support the growth in global travelers. OAG ranked the world’s airlines based on the number of seats each carrier made available to customers during 2018. U.S. carriers made a strong showing with American, Delta, United, Southwest and Alaska all in the top 20, with the former four holding the top four spots on the list. The airline industry is on track to become the single biggest emitter of carbon dioxide within three decades if the predicted cuts in other sectors materialize, data and projections from United Nation agencies show. While energy generation and agriculture currently dwarf aviation’s 1.3 percent share of all human-caused greenhouse gases, emissions from air travel are accelerating many times faster. IATA expects the number of airline passengers to double by 2037, to more than eight billion a year which will strongly contribute to the industry’s carbon emissions. Conventional means to fight climate change in the industry at an international level, such as emission caps, have not been successful. The U.S. remains the world’s largest travel and tourism economy ($1.6 trillion, 7.8 percent of U.S. GDP) despite the flat growth of Chinese travel to the U.S. last year, according to research from the World Travel & Tourism Council (WTTC). The WTTC GDP estimate includes the direct, indirect, and induced impacts of tourism GDP in the U.S. while U.S. Travel considers only the direct tourism GDP. For international spending in the U.S., the WTTC looks at just visitor spending and passenger fare receipts, while U.S. Travel references the U.S. government for total U.S. travel exports, including five unique indicators. While there are slight variations on the methods of economic calculation, both the WTTC and U.S. Travel agree that the U.S. is falling behind in the global share and expansion of travel. In the past decade, the average annual growth of Chinese travel was 23 percent. The flat growth in 2018 was partly attributed to trade tensions between the two countries, but the Chinese market accounts for 4 percent of total U.S. visitors and 11 percent of all spending, demonstrating their economic importance to the country. 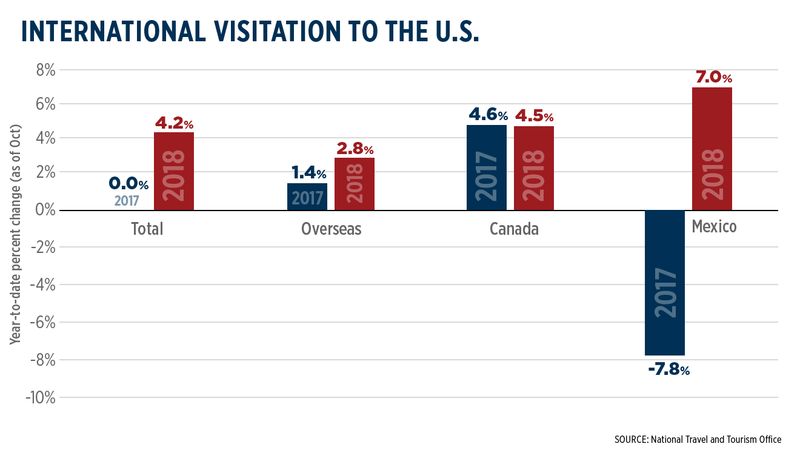 International visitation to the U.S. increased by 4.2 percent through the first 10 months of 2018 year-to-date (YTD), according to estimates released by the National Travel and Tourism Office. The estimates show a marked improvement from international visitation through the first 10 months of 2017, which remained unchanged from 2016 YTD. 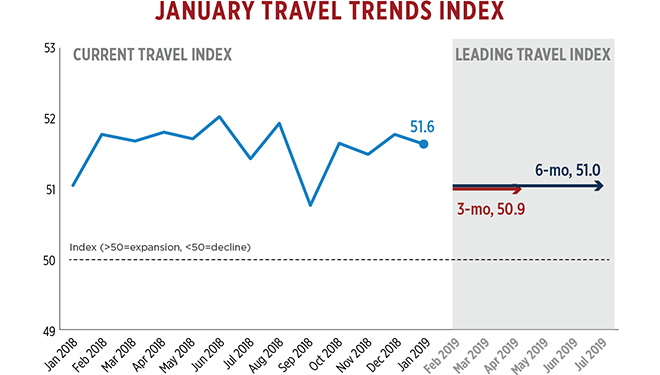 That said, David Huether, senior vice president of research and economics at U.S. Travel, noted that the "key takeaway” from the new data, which covers the June-to-October period of 2018, “is that inbound visitation to the U.S. decelerated dramatically in the second half of 2018... after increasing 6.7 percent in January-May 2018 compared to the same period in 2017, international arrivals to the U.S. increased 2.0 percent in June-October 2018.” Overseas visitors accounted for just over half (33.6 million) of the nearly 67 million international arrivals to the U.S. through the first 10 months of 2018, increasing by 2.8 percent YTD. 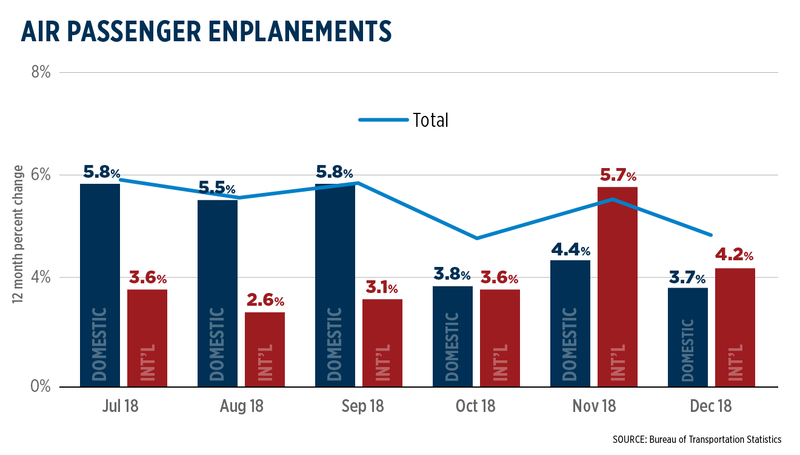 However, overseas visitations to the U.S. also decelerated through the middle of 2018: a 4.2 percent YTD change in the first five months of 2018 decelerated to 1.6 percent increase for the June-to-October period. Over 17.5 million potential Chinese air travelers were blocked from buying tickets last year due to “social credit” offenses. An additional 5.5 million were barred from buying train tickets, according to the National Public Credit Information Center. “Social credit” is when points are deducted by authorities when civilians have offenses such as unpaid taxes and fines, breaking the law, and in some cases walking a dog without a leash. This is designed to improve public behavior, but human rights activists believe “social credit” might unfairly label people as untrustworthy without telling them they have lost status or how to restore it, and it reduces the number of potential travelers from the Chinese market. 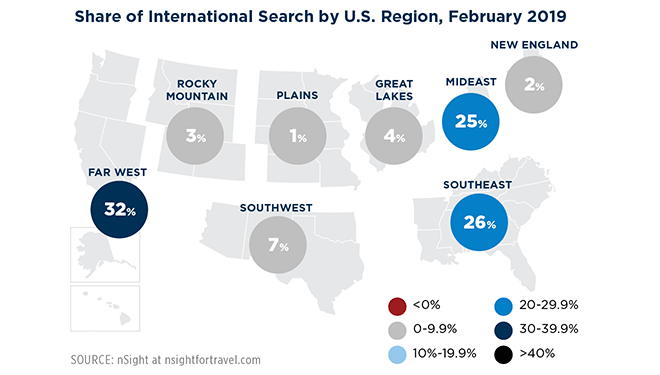 The latest U.S. Travel Barometer reported that 12 percent of international lodging searches in February were for destinations in the United States—consistent with the same time period last year. Following the United States, Spain, Italy and the UK were the top markets for lodging searches. International searches to the United States were fairly split between three regions: the Far West (32 percent), Mideast (25 percent) and Southeast (26 percent). The Far West experienced a 2 percent increase in their share of searches compared to February of 2018. The United Nations World Tourism Organization (UNWTO) recently published ‘Overtourism’? Understanding and Managing Urban Tourism Growth beyond Perceptions Volume 2: Case Studies which looked at examples of tourism issues, management and objectives of 19 global cities. The most common concerns and challenges across destinations were congestion in specific locations and sites at specific moments, mobility, pressure on infrastructure and resources, decrease in ‘place’ authenticity and impact on social fabrics and residents’ daily lives. To combat some of these issues, common measures set in place include the dispersal of visitors within the city and beyond and improving the city infrastructure and facilities. Starting in 2021, United States citizens will be required to undergo a pre-screening and registration process called the European Travel Information and Authorization System (ETIAS) before entering European Schengen-zone countries. This will entail an online application process surveying the applicant’s biometrics, health, criminal record and any previous European immigration history. The application process is estimated to only take minutes, as long as the application is not flagged to be checked manually and is valid for three years with multiple entries. The State Department confirmed the ETIAS is "not a visa," instead, calling it an "authorization” which still only allows a stay for 90-180 days. 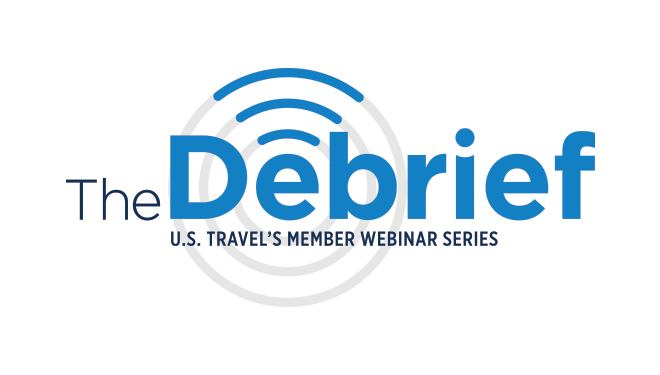 Join Director of Industry Communications Sarah Shields and Manager of Digital Communications Nikki Carpenter on Tuesday, April 23rd at 2pm for a preview of #nttw19 and the resources available as you plan for this year’s theme—Travel Matters. Learn how you can engage in this year’s daily themes and add your voice to the nationwide celebration. 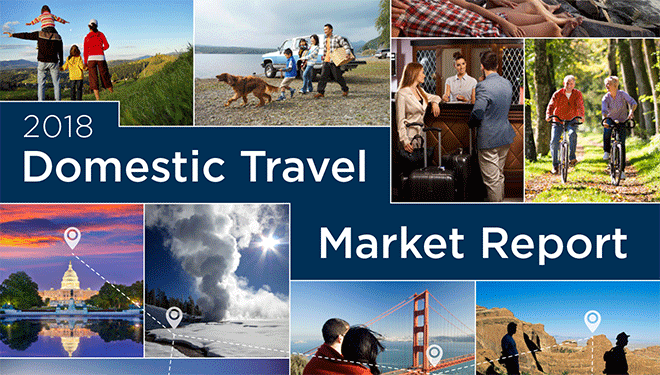 The Domestic Travel Market Report, 2018 Edition was recently released. This annual report offers insights on domestic travelers' characteristics including: primary trip purpose, accommodation preferences, changes in travel party composition and the top trip activities. The report also includes preferred travel planning and booking sources, and breaks down domestic travel characteristics by key demographics such as generation, ethnicity and race. Five-year trends and comparisons are included when noteworthy. Ever wonder about the role international inbound travel plays in reducing America’s trade deficit? U.S. Travel’s new Travel and Trade Fact Sheet outlines the significant impact international travel has on reducing America’s trade balance. We have updated and refreshed our country-level reports. The latest reports are now available for China, India, and Brazil with Germany and Israel coming soon. Additional reports will be added over the next several weeks. Please note: the latest reports reflect 2017 data, with 2018 inbound visitation statistics available this summer. 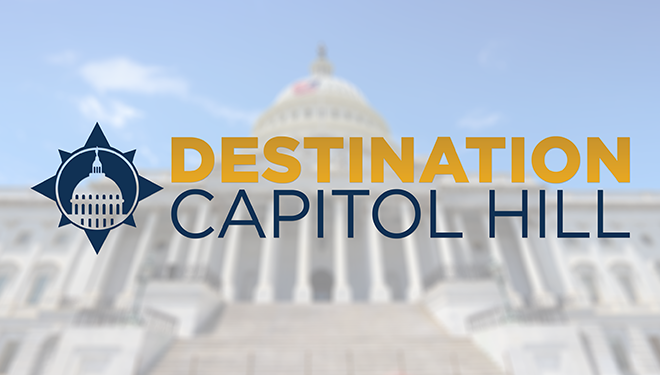 Destination Capitol Hill—the industry's premier advocacy fly-in event—will take place on April 10-11. The event brings to Washington travel industry leaders and workers from around the country to help educate lawmakers about travel's contributions to the economy and the key issues facing our industry. We will be focusing our advocacy efforts on four specific issues: Brand USA reauthorization; the introduction of a comprehensive infrastructure package; a legislative fix for the $12 billion national parks maintenance backlog; and the passage of the JOLT Act, including a renaming of the Visa Waiver Program to the Secure Travel Partnership Program. It is important that our industry's collective voice is heard in Washington. Please click here to register. U.S. Travel released a series of maps outlining the country's surface congestion problems to the House Highways and Transit Subcommittee ahead of a transportation policy hearing. Known as cartograms, the maps illustrate how congestion is impacting travel times between major U.S. cities, showing policymakers how underinvestment in infrastructure is hampering travel mobility and the American economy. Please click here to read more about the cartograms and click here to read U.S. Travel's infrastructure policy platform.